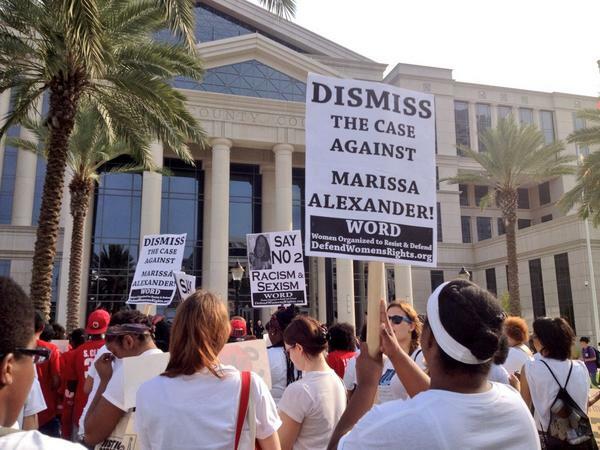 Hundreds of supporters from all over the United States marched to the Duval County Courthouse in Jacksonville, FL yesterday to demand that all charges against Marissa Alexander be dropped. Chants heard on the way to the Courthouse also underscored growing demand for State Attorney Angela Corey’s dismissal. Free Marissa Now and Sister Song, Inc. are leading a week-long mobilization on Alexander’s behalf. The Standing Our Ground Week of Action kicked off Friday, July 25 and will continue through August 1. Satellite participants in the week of action have shown their support for Alexander using the #StandingOurGround and #SelfiesForSelfDefense hashtags. Alexander, an African American mother of three, fired a warning shot after being strangled and threatened to death by her estranged husband in August 2010. A restraining order was in place at the time of the incident. Alexander’s husband, Rico Gray, has a well-documented history of domestic violence against Marissa and other former partners. Alexander was once hospitalized because of injuries sustained in an incident with Gray. Nevertheless, Florida’s mandatory minimum sentence for “pulling the trigger during a crime” is 20 years. Alexander could face up to 60 years in prison for allegedly endangering Gray’s life and the lives of her two stepsons. “Today, it’s Marissa. Tomorrow, it’s you. And yesterday, it was Trayvon,” said poet Staceyann Chin with Free Marissa Now. “We see this as a human rights violation against [Marissa’s] right to parent, against her bodily autonomy,” Monica Simpson, Executive Director of Sister Song, told WTEV-TV. Last week, a judge denied attorneys’ requests to grant Alexander a new hearing under Florida’s “Stand Your Ground” law. In June, Florida Governor Rick Scott signed a bill into law that includes warning shots under “Stand Your Ground,” but it will not retroactively apply to Marissa Alexander’s case. Free Marissa Now and Sister Song intend this week’s action to coincide with Alexander’s retrial, which was previously scheduled for this month. A Florida appeals court ordered a new trial for Alexander after finding the lower court had issued improper jury instructions on self-defense. Alexander is now set to be retried in December.